I’m pimping my workâ€”but that’s fair game, no? 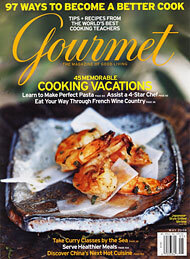 A rather substantial effort went into this month’s issue of Gourmet, and the results are now in print. Several weeks last fall and early this year had me pounding, sweating and stirring in the kitchens of five Southeast Asian cooking schools. Take a peek at the magazine to learn more about old-world village food at Thai House, just outside of Bangkok; the sweaty, hard-core kitchen of Chiang Mai Thai Cookery School’s Master Classes; Luang Prabang’s down-to-earth (and refreshingly authentic) Tamarind; and the twin indulgences of Chiang Mai’s Four Seasons and the Mandarin Oriental Dhara Dhevi. Nice articles! I was in Thailand recently and took some classes at Blue Elephant and The Oriental Cooking School. I’m planning to go back again to take more classes. What school can you recommend so I can learn the authentic way of cooking Thai? I thought Pip at the Thai House did a fabulous job, if you want a traditional village-style experience. It’s possible to get a lot of one-on-one with Pip, and she’ll teach you as much about the culture as the kitchen. For more advanced cooking, try the Chiang Mai Thai Cookery School’s Master Class. As you might know, cooking schools are a dime a dozen in Thailand. Many are fun for a few hours, covering just the basics. They’re good for beginners looking for a general understanding of Thai food. But if you want more, it can be a trick to weed through the usuals.